We can help you design and install any kind of closed circuit television system using the latest in PC or Linux based technology for your residential or commercial needs. CCTV Surveillance systems are now being used widely. People are using CCTV systems with remote viewing to make sure their houses or commercial properties are deterred from crimes of burglary break-ins. We can design and install a security system that starts recording on a DVR as soon as the cameras detect any movement. The DVR's are hooked up to the internet and you can view your house or a retail shop from anywhere in the world. CCTV Surveillance Cameras CCTV Surveillance Cameras For Home And Work When one thinks of CCTV surveillance cameras we think of all the cameras we see in the numerous public places we visit every day. We often feel like Big Brother is watching you – there are CCTV surveillance cameras in airports, banks, shopping centres, parking lots and numerous other places. However CCTV surveillance cameras are not just limited to banks and airports, they are also used in homes and offices. The reason why? These systems are very effective in ensuring the safety of you and your family and employees. They also serve as a deterrent for would be thieves and criminals. The installation of CCTV surveillance cameras in homes, factories, offices, farms, airports and banks is a critical component of a trustworthy security system. CCTV surveillance cameras are vital in identifying breaches in security and as a warning system in identifying potential security threats. At home, CCTV surveillance cameras that placed strategically at entrances to the property give residents the ability to see who is at the gate and to ascertain whether these people are friendly or not . In commercial environments CCTV cameras can be used to monitor the entire premises for security breaches and trigger the appropriate response. Secure All Security have 10 years of experience in the installation of security solutions and we have fast become the market leaders in this area. We stock a wide range of CCTV surveillance cameras for both the domestic and commercial sectors. When it comes to choosing your CCTV camera system speak to Secure All Security. We will assess your security needs and come up with the best. When you install Secure All Security CCTV surveillance cameras you can be sure that your entire security operation will benefit, making your premises a more secure, safer place to live or work. Security CCTV Cameras The Benefits Of Security CCTV Cameras The benefits of installing security CCTV cameras at your factory or workplace are numerous. By installing security CCTV cameras you are providing a safer working environment for you and your employees as well as making sure that your business runs effectively and efficiently. A CCTV (Closed Circuit Television) system can consist of a single security CCTV camera and monitor or they can be a complex system of cameras, digital recorders and multiple operators. By installing security CCTV cameras you are providing a deterrent for potential thieves. When security CCTV cameras are observed many opportunist thieves will think twice before trying to break-in and will often look for a place that is not so well secured and observed - the same applies to shop lifters and crooked till operators. You will find that security CCTV cameras will more than pay for themselves in the end once you calculate what you have saved on stolen or lost stock. Secure All Security are security systems experts based in Pretoria. With over 10 years of experience in the installation of security CCTV cameras and other security systems we have the know-how to advise you on what security systems you should have in place, whether it is in your home, factory or office. We have built up an impressive record of clients and our scope of service now includes electric fence installation, access control systems, garage and gate security systems such as electric gates and CCTV monitoring systems. We design and manufacture our own steel products and use only quality equipment in all other aspects of our business. We at Secure All Security have the knowledge, experience and expertise to deliver the most effective security systems – whether it is installing electric gates or setting up a security CCTV cameras system. We will assess your needs and requirements and deliver a tailor-made solution to you. Security Surveillance Cameras Safe And Sound With A Security Surveillance Camera It is all well and good to feel safe stuck behind high walls at home, but you also need to know what is going on outside. By installing a security surveillance camera you are able to keep an eye on the outside whilst you are inside. The advantage to a security surveillance camera is that you are able to see who is at your gate before you let anyone in and check before you drive out of your garage. There are many good security surveillance camera systems to choose from, that it can be difficult deciding which security surveillance camera is appropriate for your setting. You should try and get a basic understanding of how a security surveillance camera system works before embarking on your purchase and installation. If you need help with what security surveillance camera to buy then talk to Secure All Security. We have been installing security systems in South Africa for over ten years. We have considerable expertise in security system installation and our area of expertise includes electric fences, access control systems, garage and gate automation and security surveillance camera installations. Secure All Security has the skill and know-how to advise and install a security surveillance camera in homes and businesses. We are committed to ensuring your premises are properly protected against unwanted security breaches. Secure All Security’s knowledge of security surveillance cameras will be invaluable in ensuring that you can keep an eye on events and activities taking place in and around you and at all times. We offer a wide variety of different security surveillance camera options that range from a one camera installation for domestic use through to a high tech multi-camera system that is ideal for offices and factories. Security Surveillance Camera System An Innovative Security Surveillance Camera System Should your business have a security surveillance camera system? Absolutely! With crime rates on the rise, a good security surveillance camera system will provide excellent crime prevention. Do you want to know exactly what your employees are doing? What time they are getting to and leaving work? Then you need a security surveillance camera system that will allow you to track the comings and goings in and around your business. Every business should have a security surveillance camera system to monitor all aspects of your business from the back door to the front door. By implementing a security surveillance camera system that links your existing computer point of sale system you can record everything that happens, ensuring all transactions done are done correctly and are above board. With a security surveillance camera system you won’t miss a thing! Secure All Security prides itself on being security specialists who know how to come up with security solutions to meet your specific needs. With over 10 years of experience in the business we can help you with everything, from security system installation through to electric fences, access control systems, garage and gate automation and an innovative security surveillance camera system tailored to your specifications. 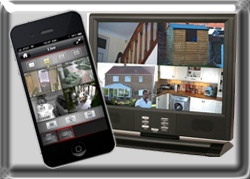 We are specialists in security surveillance systems for both homes and offices. Our larger systems are available for use in factories, shopping centres and offices. In installations of a security surveillance camera system like these, a dedicated computer is used with about 16 cameras linked to the PC. This sophisticated system allows for digital recording, connection to the internet, setting of alarms and zooming in and controlling of cameras. These systems can also be integrated with access control systems. To run a business effectively you need to minimise stock theft, shop lifting and any other criminal activity. The best way to do this is to install a security surveillance camera system. These systems will more than pay for themselves when you’ve worked out what you save on theft and crime prevention. CCTV Camera Installation Professional CCTV Camera Installation When you have decided to improve the security measures in your workplace with CCTV camera installation, you need to understand that the planning phase of the installation may be the most important part of the process. Firstly, the cameras need to be installed correctly to ensure that they are sending a constant live feed to relevant monitoring systems around your company. It is also important to ensure that each item is secured properly to walls, ceilings or other surface to prevent them from falling down and causing or becoming damaged. But the planning phase is mostly important to take into consideration the placement of the equipment throughout the CCTV camera installation process. You want as few cameras as possible to cover as wide an area as possible. Entrances and exits to your premises and sensitive or authorised areas within the workplace will also need to be taken into consideration with CCTV camera installation. It is very important that these cameras can record information regarding each and every person either leaving or entering the specified areas without any blind spots being created by walls corners and doorways. It is also important that your CCTV camera installation expert does not place the cameras too high or low. Cameras that are too high will just record useless information about the top of people’s heads while CCTV camera installation that is too low will cut people’s heads off in the images. Make sure that you provide your CCTV camera installation professionals with a floor plan of your office space as well as any other areas both indoors and outdoors where you feel you require surveillance. The installation expert can the begin picking the best spots for your cameras to be placed. CCTV Cameras Pretoria The Benefits Of CCTV Cameras In Pretoria With the installation of CCTV cameras in Pretoria, the crime rate has steadily fallen in and around the city centre. Not only is it easier to identify and capture criminals caught in the act but this surveillance equipment deters individuals from having any criminal intentions in the first place. The whole premises around surveillance and monitoring technology is based on the fact that human beings are less likely to commit a crime if they know that they are being watched You can have the same level of security in your company by having CCTV cameras placed in strategic points around your premises. But CCTV cameras in Pretoria are not just being used to for the above mentioned two purposes but in successfully prosecuting criminals to the full extent of the law. The footage recorded by the CCTV cameras can be used as evidence to charge a suspect with a crime and is also accepted in the courts as material evidence to convict the criminal of their actions. Used in conjunction with the latest and greatest software programs that data stored by the CCTV cameras can be manipulated to show different camera angles to identify people and the acts they are engaged in better than ever before In addition to all this, CCTV cameras in Pretoria give you 24 hour, 7 days a week monitoring capabilities. The live feed from the CCTV cameras can be sent to dedicated monitors as well as your computer or laptop. You can therefore view the activities that are taking place on your premises whenever you need to wherever you may be. CCTV cameras can also be used in conjunction with a number of other security products to give you the most comprehensive security measures available. CCTV Security Systems CCTV Security Systems, Cameras And Monitoring Equipment One of the most widely used CCTV security systems that you can acquire for your home is a small black and white camera attached to an intercom system at the main entrance to your property. These types of CCTV security systems provide you with the means to visually identify people who want to gain access to your property as well as to communicate with them to find out their intentions for visiting your residence. There are however a few disadvantages to using these more simplistic CCTV security systems. One of these disadvantages is that no footage received from the camera will be recorded. The camera as part of these CCTV security systems will also only turn on once someone presses the bell or when you pick up the hand held device to communicate with individuals outside your property. Newer and more innovative CCTV security systems will provide you with continuous live feed that can be monitored on dedicated screens, attached to existing television screens in your home or fed to a computer or laptop. These cameras can be attached to recording devices that store images as data which can be easily retrieved so that you know what has happened on your property even when you are not monitoring the screens. More updated CCTV security systems also have cameras that include infrared viewing capabilities that allow you to clearly see everything in and around your property even on the darkest nights. Motion sensors can also be attached to the cameras as an energy saving tool which will only turn the cameras on and alert you when motion is detected on your property. Always remember to get a professional assessment of your requirements for CCTV security systems before choosing the right cameras to suit your needs.Corporate CCTV Security Cameras Employee Monitoring With Corporate CCTV Security Cameras Although many companies and businesses use corporate CCTV security cameras to monitor and provide surveillance for outsiders and visitors to their premises, there is an added benefit for their use in the corporate environment. This added benefit relates to the ability for management and executives to keep an eye on what the employees in the office are up to at all times. Soon after installation of corporate security cameras it will become clear which employees are not taking their jobs seriously and who are the hard workers that keep your company on track and running smoothly. Corporate CCTV security cameras have full functionality which means that you have full control over the footage being received by the surveillance equipment. This basically means that you have the ability to remotely move the cameras from left to right and up and down. The corporate CCTV security cameras also allow you to zoom in and out on specific point where you would like to focus. This functionality gives you the ability to focus clearly on what is happening on a person’s computer screen or on their work desk. No more illegally surfing the World Wide Web or playing solitaire when the boss’ back is turned. There are, however, some legal implications that you will need to keep in mind when installing corporate CCTV cameras to monitor your employees in the workplace. The corporate CCTV security cameras cannot be placed in any areas where they might infringe on an employee’s right to privacy such as in bathrooms. You will also need to make all your staff members aware that they are being monitored at all times and get them to sign a declaration stating this.